We understand that you are looking forward to receiving your item(s) as soon as possible so we endeavor to ship your order the same day we receive it if received before 3:00pm, if not it will be shipped the following day. 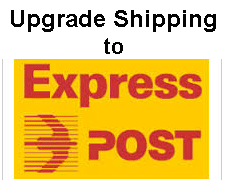 International: Shipping to International customers is via International Air Express Post (Australia Post). Delivery times will vary by destination (and subject to any local delivery issues) with Australia Post indicating an average 7-10 business days delivery for most destinations Globally. Unfortunately Tracking facility is not available for standard International Airmail. See below for Priority Shipping options. Within Australia: All shipments are via Australia Post, Parcel Post Service. Once we have sent your item(s) we will send you an email with a tracking number and a link to the Australia Post site so that you can track the progress of the parcel. Australia Post advise delivery within Australia to be 3-5 business days. If you have not received your item(s) by day 6 please contact us an we will chase it up with Australia Post. See below for Express Post option. PRIORITY Shipping Upgrades: for details please follow this link to our Priority Shipping Upgrades to your destination. Tracking facility is provided with Priority Shipping. Our return policy essentially is that the customer contact us via email to advise us that they wish to return an item stating the reason for the return upon which we will advise the address to return the item to. The customer is then to return the item to us at their cost such that it is received by us in an undamaged state, i.e. that the item is packaged sufficiently as not to be damaged in the post. Upon receipt we will examine the item for damage or faulty workmanship. If the reason for the return is for faulty workmanship and our examination confirms that the item is faulty we will refund the purchase price and shipping both ways. If we do not find any fault we will advise the customer accordingly at which point the customer has two options, request return of the item to the customer, the cost of postage to be at the customers expense, or if the item is in a resalable condition we will refund the purchase price of the item only at the customers request, excluding any shipping costs, i.e. we will not refund shipping charges or the customers refund shipping costs if we determine the product is not faulty. We do not offer full refunds for reasons such as 'I don't like it' or 'I don't like the chime sound' or 'I have changed my mind'. In such cases if a refund is in fact offered it will incur a 25% restocking fee and hence refund 75% of the purchase price of the item excluding shipping/postal charges, subject to the item being in a resalable condition. Items damaged in shipping; As we package our items with excellent care and materials it is very unlikely your item(s) will get damaged in the post - in the unlikely even that this happens notification via email will need to be made to us within 48 hours of receiving the damaged item so we may lodge the relevant report with Australia Post. It may be helpful to take images of the damaged envelope/satchel that the item was delivered in. It should be understood that Australia Post has the responsibility for damage in transit. Please enjoy your shopping for your Harmony Ball, we are sure you will find that special Harmony Ball pendant or Birthstone Harmony Ball here in our site.